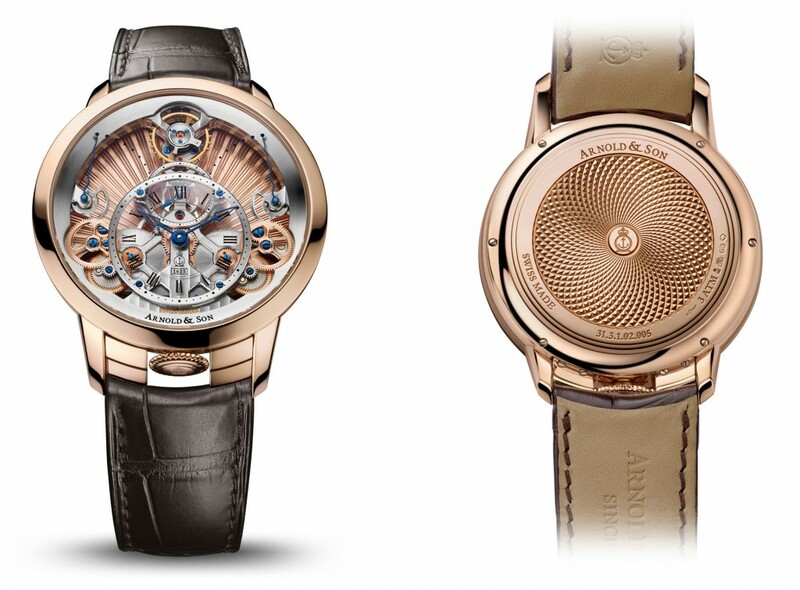 Swiss watch manufacturer Arnold & Son has announced the launch of the Time Pyramid Guilloché, a new addition to its Instrument Collection. The 44.6 mm case contains an in-house A&S1615 movement, which has been hand-chamfered. The case, made from 18-carat red rose gold, is decorated with a guilloché pattern on both sides. The movement has a skeletonised pyramid-shaped architecture. The design relies heavily on its 3D effect, with its indications built on three levels. The subsidiary seconds dial on the bottom, the hour indications on a sapphire crystal dial in the middle, and a silver top ring for the minutes indication. 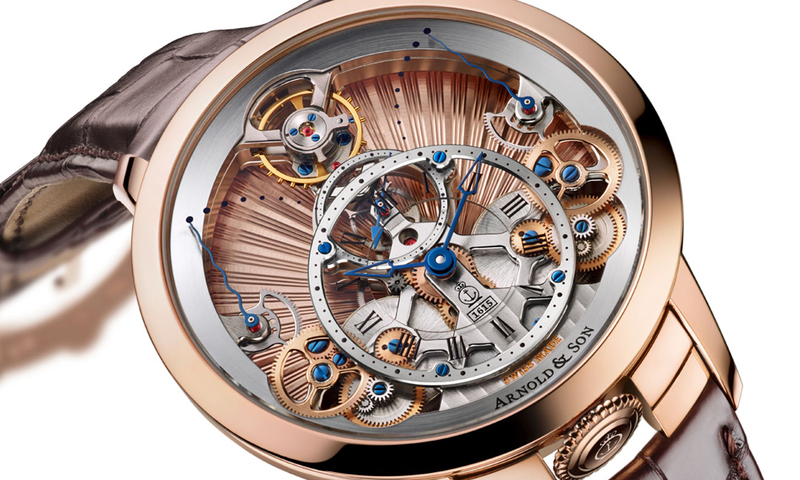 It is topped off with Arnold & Son’s logo engraved at the six o’clock position. The gear train runs vertically in a linear format connecting two barrels at six o’clock to the balance wheel at twelve o’clock. The bridges have been designed so that all of the wheels, the two mainspring barrels, the escapement and balance wheel are visible through the dial side. 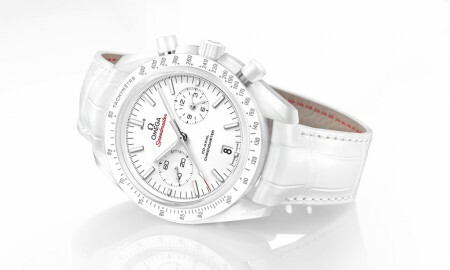 Each timepiece is supplied with a hand-stitched alligator strap in brown. The Time Pyramid Guilloché will boast a minimum power reserve of at least 90 hours and is water resistant up to a pressure or 4 bar or 30 meters / 99 feet. 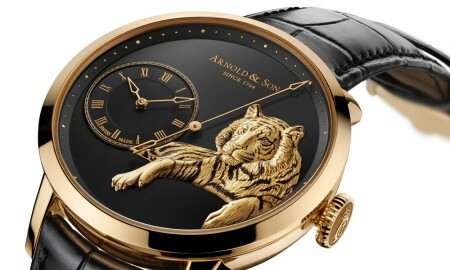 In addition, Arnold & Son recently announced the TB Tiger, a limited edition timepiece featuring the engraving of a tiger in 22-carat gold and limited to just 28 pieces. Arnold & Son’s Instrument Collection combines instrument precision with classical styling, offering a selection of beautiful timepieces. Skeletonised nickel-silver movement, with rhodium treated with Haute Horlogerie finishing.